The Nexus Prominent R case is your best choice premium chassis for a silent computer. It's toolless installation features make it a breeze to install your components or change your set-up. The sleek professional look and materials make the case fit in anywhere. The Prominent R have a black painted interior which is great looking. Preinstalled are two 120mm Real Silent Nexus Fan. 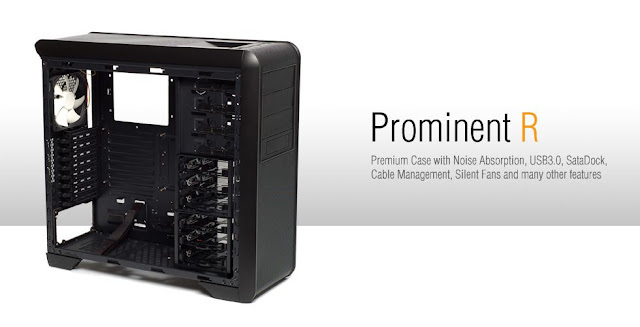 There is noise absorption material on the side panels and isolating padding where the PSU is placed to prevent resonance, ventilation holes (and room for a fan) in the bottom of the case for air-intake and high feet (with rubber pads) keep the case elevated from the floor to make a smooth airflow possible and eliminate resonance. There is cable and fan management and on top we have an external SataDock, USB3.0, USB2.0, E-Sata and audio connectors. Check the website for more information. Can't seem to find this case sold anywhere. Looks identical to Rosewill's Blackhawk case. But I don't like the window job Rosewill has done, nor the stock blue led fans they put in it. Anyone know where to find one of these? I've been looking for that case but I'm really having a hard time. I hope you can list down the stores where I can buy one. Thanks.